The Georgia State football program marches its ninth team into the 2018 season, fresh off of winning its first bowl game. However, this team is different in more ways than similar compared to last season’s history-makers. Seven starters return on offense and five on defense—that’s only 12 out of a possible 22 returnees. The other 10 departures were huge contributors to the team, such as quarterback Conner Manning, cornerback Jerome Smith (who may make the defending Super Bowl champions’ opening day roster), linebacker Trey Payne and versatile running back Glenn Smith. Many new starters will be taking the reins from these departing 10, indicating that an influx of youth will be a big theme of the season for head coach Shawn Elliott and his staff. This influx just might pay off for the program. Sun Belt Conference head coaches projected in their preseason poll that the Panthers would finish third in the East Division. Coupled with high expectations for Georgia State football in Atlanta, the Panthers won’t look back this season—only forward. “I don’t think we have to deal with it. Our roster is almost flipped in half. We’ve got to just continue to work and do the things to build on a successful year. We don’t dwell on the past, we don’t dwell on a bowl game. Half of those guys are gone now, so that’s not even something we think about,” Elliott said. If the Panthers even match last year’s results, it would be the first time they complete consecutive winning seasons. That would most likely require them to win at least half of their Sun Belt schedule because of the tough trips to North Carolina State and Memphis and a home game against Western Michigan. 2018 is the first time the Sun Belt will use divisions, and the winners will play in a championship game at the home of the division champion with highest conference winning percentage. “I really want our players to understand how important it is that we have opportunity to get to that championship game and play for a championship, but first I want to make sure that the steps necessary to get there are right in the front of the mind,” Elliott said at the Sun Belt Conference Football Media Day in early August. Georgia State’s 2017 run offense was among the worst in the nation (No. 113 with 117.3 yards per game), but newly hired Tim Bowens will coach the position in 2018. The unit loses Smith and Kyler Neal, both 1,000-yard career rushers. Taz Bateman, Demarcus Kirk and three freshmen will try to replace the production. The receiving core returns Penny Hart, a third-team preseason All-America selection, Devin Gentry and Jonathan Ifedi, who caught 14 passes for 128 yards in the final three games of 2017. The starting quarterback will have versatile weapons to rely on. Dan Ellington and Aaron Winchester are the frontrunners in the competition. Ellington (6’3, 215 lbs.) shined at Itawamba Community College in 2017 and passed for 3,211 yards and 17 touchdowns on a 65 percent completion rate. He also ran for 392 yards and eight touchdowns. The game will be the first for Kennesaw State against an FBS program. The Owls and Panthers have only played three and eight years of football respectively and never against each other. Georgia State is on a three-game losing streak in season-openers and won only one of five home games last season. Kennesaw State brings down the No. 5 ranked FCS program to Atlanta. When he was asked about the final steps of preparations for Kennesaw State, Elliott said, “We’ve got to be smart.” The Owls run a spread option offense and have the reigning Big South Offensive Player of the Year, Chandler Burks, at the helms of it. Burks, a dangerous dual-threat quarterback, threw and rushed for 1,000 yards in 2017, accounting for 27 total touchdowns. But Georgia State had one of the Sun Belt’s best run defenses a year ago, and it still has good athletes despite the departures of Payne, MacKendy Cheridor and Julian Laurent. Even with Burks’ talent, Kennesaw State still has questions to be answered on the offensive line. Their head coach, Brian Bohannon, said the line will be a key indicator on how the team’s offense will perform in 2018. The Owls led the FCS in rushing last season, averaging over 300 yards per game. “Solidifying some things [on the offensive line] is going to be critical for us. We lost a couple of guys that played a lot of football for us,” Bohonnon said in the Big South’s season preview. They return many players at their skill positions, and though it can’t make up for less experience on the line, it can help immensely. The Owls get back their top three rushers in Burks, Shaquil Terry and Jake McKenzie and their two leading receivers from 2017. On the defensive side of the ball, Kennesaw State is replacing both starting cornerbacks and a starting safety. Their pass defense will have their hands full with the FBS’ leading receiver in touchdowns and yards, Hart. The Panthers also added plenty of size to the receiving corps in their 2018 recruiting class. 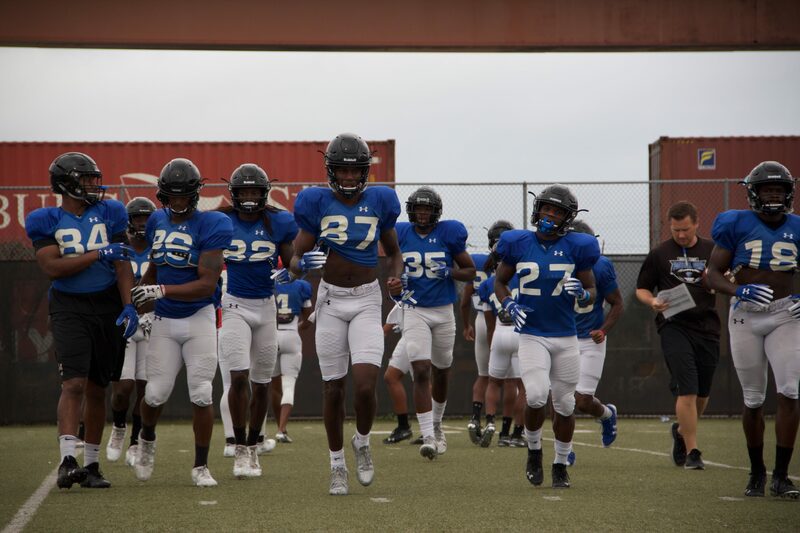 Georgia State’s talent at receiver and four returning offensive linemen should be able to limit any problems that the Panthers’ quarterback has. Georgia State’s inexperienced defensive line will battle Kennesaw State’s inexperienced offensive line, and the line who performs best will greatly influence the game. If the Panthers keep the Owls from holding their Turnover Plank in the air, their chances of winning their first opening day game since 2014 will be stronger. After Tennessee State unexpectedly beat Georgia State in the grand opening of Georgia State Stadium last year, home attendance was sparse for the rest of the season. Kickoff for the game is set for 7 p.m. on Aug. 30 at Georgia State Stadium and can be streamed on ESPN+.